1.1. 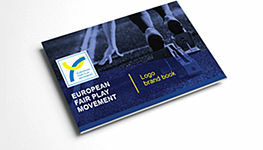 The name of the Association is “European Fair Play Movement”, also referred to below as EFPM. 1.2. The EFPM is a non-profit, non-political, autonomous body, independent of other national or international authorities, and represents the common interests of its members, being the fulfillment, development and promotion of the EFPM aims. 1.3. The EFPM does not aim to make any profit and is managed on an honorary basis. 1.4. The EFPM symbol consists of two embracing curves, i.e. an ascending yellow curve and a descending light blue curve, placed on a white square with a dark blue frame used alone, in one or several colors as per the illustrations attached. It is an integrated design, associating the two embracing curves with another distinctive element. 2.1. 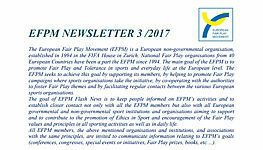 The EFPM promotes and develops Fair Play in sport, education and everyday life, primarily in Europe. The EFPM reflects a philosophy of life, abiding by universal ethical values, seeking to create, in the spirit of Fair Play and based on the educational value of good example through sport, a better world, pleasure found in sport with tolerance and respect for competitors. 2.2. 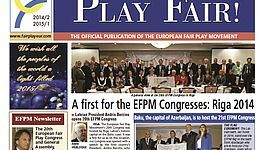 In order to achieve its aims, the EFPM helps to organise Fair Play initiatives, when sport and educational organisations plan to launch Fair Play campaigns, facilitates regular contacts between sports and educational organisations, in order to support their Fair Play goals, as well as their sports events, promotes the exchange of information between members, collaborates with the media and public authorities, in order to promote and disseminate Fair Play issues, represents the common EFPM position within non-governmental and governmental organisations and Fair Play bodies dealing with sports and ethical issues, organises congresses, seminars and any other appropriate events for the promotion of Fair Play issues, organises Fair Play Awards. 3.2. “Corporate members” are European national sport entities and sport organizations with aims coinciding with the aims of the EFPM. Each European country is to be represented by only one sport entity or organization, which has the right to speak and vote in the EFPM General Assemblies (10 votes each) as well as to present candidatures for posts at the EFPM Executive Committee, given that it fulfils the obligations set forth in the present Statutes. 3.3. “Associated members” are international sport entities and organizations which have established a mode of bilateral cooperation with EFPM (Joint Venture, Memorandum of Understanding or else) in the field of Sport and Fair Play. The Associated members have the right to speak and vote at the EFPM General Assemblies (1 vote each). 3.4. “Supporting members” are persons, bodies, institutions, organizations and / or commercial enterprises that support the aims and goals of the EFPM through financial or other contributions. The supporting members have the right to speak but not to vote at the General Assembly. 3.5. “Honorary members” are European personalities or organisations having distinguished themselves in the promotion or in acts of Fair Play. Nominations for such memberships shall be presented by the Executive Committee to the General Assembly and the acceptance of said nominations must be approved by at least a two-thirds majority of the cast votes. The Honorary members have the right to speak and vote at the EFPM General Assemblies (1 vote each). 3.6. “Applicants” are European national sport entities and sport organizations with aims coinciding with the aims of the EFPM, the affiliation of which has not been finalized, their application being under examination. The Applicant members have the right to speak but not to vote at the EFPM General Assembly. 3.7. All members are obliged to be bound to the present Statutes and they shall act to the best of their abilities in favour of the aims and the interests of the EFPM, benefiting consequently from all the rights deriving from the present Statutes. 4.1. Each European country may be represented by only one national organisation as an EFPM member. 4.2. If two or more national bodies within a country claim membership, it will be given to the one which is recognised by the respective National Olympic Committee. 4.3. No more than one European body governing one sport shall be allowed membership. 4.4. If two or more European bodies governing the one sport claim membership, it will be given to the one which is recognised by the International Olympic Committee. 4.5. Application for membership shall be made in writing to the General Secretary, on terms previously fixed. 4.6. The affiliation of any member is subject to approval by voting by at the General Assembly, following the recommendation of the Executive Committee. The admission or not of a new member shall be announced by the General Secretary, immediately after the end of the voting procedure. 5.1. The official EFPM Head Office is in Vienna, Austria. 5.2. The official language of the EFPM is English. All official documents and correspondence must be written in this language, with the exception of the EFPM Statutes, which will be published in English and French. In this last case and in the event of doubt or differences, the English edition shall prevail. Congresses, meetings and sessions shall be held in English. 7.1 The General Assembly is the sovereign authority of the EFPM. It is made up of delegates appointed officially by all EFPM members. 7.2. The General Assembly is held once a year and is convened at the same time and place as the annual EFPM Congress, if possible. Further proposals from EFPM members, as well as nominations for candidatures in case of elections, must be received by the General Secretary at least thirty (30) days before the opening date of the General Assembly, in order to be included in the final Agenda. 7.4. The General Assembly may consider only items, which are included in the final Agenda and may settle all cases that have not been anticipated by the present Statutes. 7.5. All EFPM members are entitled to attend to the General Assembly, represented by a maximum of two delegates, who have the right to speak but only one shall have the right to vote. Honorary members have one vote each. Corporate members have ten votes each. Supporting members have no vote. 7.6. An EFPM member is entitled to be represented by another EFPM member by means of a written proxy. An EFPM member can carry no more than two proxies, valued in accordance with the identity of the represented member (honorary or corporate). 7.7. The General Assembly will only open if a quorum of forty per cent (40%) of the total number of the EFPM members is present . 7.8. All votes for elections, affiliations or expulsions of EFPM members and/or questions of particular importance shall be held by secret ballot. Voting for general issues shall be performed by a show of hands or by a roll call, unless the President or at least one quarter of the EFPM members that are present call for a vote by ballot. 7.9. All decisions shall be taken by a simple majority of votes, unless the Statutes specify otherwise. In the event of a tied vote, the proposal shall be rejected. 7.10. Representatives of countries, organisations or personalities that are not members of EFPM, may attend the General Assembly and other EFPM activities as observers, subject to approval by the Executive Committee. Observers shall have the right to speak only upon invitation and with the authorisation of the President of the General Assembly. 7.11. Candidates for the post of the President and the post of an Executive Committee officer must be nominated by the national EFPM member organisation to which the candidate is associated. Members of the Executive Committee may re-stand for election at their own free will. All applications for candidature shall be submitted to the EFPM General Secretary not later than 30 calendar days prior to the commencement of the General Assembly. 7.12. A simple majority of votes is required for the election of Executive Committee officers. If no candidate for a given post receives this majority, a second vote shall be taken between the two candidates who received the most votes in the first ballot. In the event of a further tied vote, the decision shall be made by drawing lots. 7.13. The General Assembly shall be chaired by the President of the EFPM. In the absence of the President, the General Assembly shall be chaired by the duly appointed Vice President. 7.14. The General Secretary shall draft the Minutes of the General Assembly and shall distribute them to all EFPM members within two months of the conclusion of the General Assembly. 8.1. An Extraordinary General Assembly shall be held if so decided by the General Assembly or the Executive Committee or upon written request to the General Secretary by current EFPM members who represent 40% or more of the actual votes. 8.2. The venue for an Extraordinary General Assembly as well as its date shall be determined by the Executive Committee. The relevant Agenda shall indicate among others the reasons for holding an Extraordinary General Assembly. 8.3. The procedures of an Extraordinary General Assembly shall be the same as those of an ordinary General Assembly and the decisions to be taken shall accordingly have equal validity. 9.1. The Executive Committee shall conduct the administrative and financial activities of the EFPM between the sessions of the General Assembly. 9.2. The Executive Committee shall be elected for a four-year term of office by the first General Assembly after the conclusion of the Olympic Games and shall have nine (9) members, namely the President, two Vice Presidents, the General Secretary, the Treasurer and four Members. The Executive Committee officers must originate from different EFPM member national organisations, without prejudice to whoever first introduced his/her candidature for this office. 9.3. The Executive Committee shall elect from among its Members the two Vice Presidents, the General Secretary and the Treasurer. 9.4. The Executive Committee shall meet at least twice a year with the presence of a quorum of at least fifty per cent (50%) of the Executive Committee Members. 9.5. Decisions shall be taken by open vote and simple majority. In the event of a draw, the President or his deputy shall have the casting vote. 9.6. An officer of the Executive Committee loses his/her office only by resigning, by serious physical causes or by final and irreversible judgement or conviction by state or sports authorities for actions that contradict the aims and the ideals of Fair Play. 9.7. If due to resignation or any other reason a post in the Executive Committee becomes vacant, the Executive Committee may co-opt a replacement, who shall serve until the next General Assembly, which will approve or not said co-option. If the co-option is approved, the co-opted member shall complete the term of office for which the original member had been elected. 9.8. If five or more members of the Executive Committee resign, the next General Assembly – Ordinary or Extraordinary, whichever is more convenient – shall elect anew the whole Executive Committee and the President. The new Executive Committee shall conduct its duties accordingly, completing the term of office for which the original Executive Committee had been elected. 10.1. The President shall be elected directly by the General Assembly. 10.2. The President chairs the General Assembly, directs the EFPM and represents the EFPM before third parties. 11.1. The Executive Committee shall appoint two of its members as Vice Presidents, who shall in turn represent the EFPM whenever the President is not available. 11.2. The Vice President to replace the President whenever needed shall be nominated by the President. 12.1. The Executive Committee shall appoint one of its elected Members as General Secretary. 12.2. The General Secretary shall conduct the administration of the EFPM, implement the decisions of the General Assembly and the Executive Committee, and maintain relations with EFPM members as well as with third parties. 12.3. The General Secretary shall be responsible for drafting the Minutes of the sessions of the General Assembly and of the Executive Committee and shall keep their approved texts. 12.4. The General Secretary shall maintain orderly files and archives and shall handle all EFPM correspondence. 12.5. The General Secretary shall keep orderly accounts of all financial transactions, approved by the Executive Committee. 13.1. The Treasurer shall prepare the balanced accounts for each fiscal year, before the end of March of the following year, and shall submit them to the Board of Auditors together with the relevant documentation. 13.2. The Treasurer shall render, for the benefit of the General Assembly, the annual report on the financial situation of the EFPM. 14.1. The Board of Auditors consists of three (3) EFPM members and has a term of office of four (4) years. The members of the Board of Auditors are elected by the General Assembly from among the representatives of the EFPM members, attending the Assembly. The members of the Board of Auditors nominate from among their number a member to serve as Chairman of the Board. 14.2. The Board of Auditors shall examine the accounts submitted by the Treasurer together with the relevant documentation and will report their conclusions on the state of the accounts to the General Assembly, via the General Secretary. 15.1. The fiscal year commences on 1st January and ends on 31st December. 16.1. Any tangible and intangible assets shall be managed by the EFPM Executive Committee, upon authorisation by the EFPM General Assembly. 16.2. EFPM will serve exclusively and directly the non-profit purposes of its member organizations. Any financial means of EFPM may be used for statutory purposes only. Subsidies from governmental and non-governmental organisations. Donations from national, international and legal entities. Profits gained from EFPM publications and/or materials. The subsidies and the donations shall be accepted by the Executive Committee as befits the aims and objectives of the EFPM. 16.4. The EFPM members shall pay to the Treasurer the membership fee each year, prior to the annual General Assembly. This annual fee shall be determined in value and fixed by the General Assembly, upon proposal by the Executive Committee. 16.5. New EFPM members will pay the fee starting from the following year of their affiliation and onwards. 16.6. All television, radio, film, photographic, contractual and proprietary rights of EFPM events are the exclusive property of the EFPM. These rights may not be sold or negotiated without the written consent of the Executive Committee, which may delegate its authority to negotiate the sale or utilisation of these rights, but which shall retain sole responsibility for the final decision and for the utilisation of the income derived from the sale of rights. 17.2. The General Assembly shall decide by at least a two-thirds majority whether an EFPM member no longer fulfils the conditions which qualified it for membership and expel it from the EFPM. 17.3. EFPM members that fail to pay their membership fees for three consecutive years or for four years in total shall be expelled from the EFPM. 17.4. Any EFPM member which has resigned or has been expelled from the EFPM and wishes to rejoin shall have to pay a re-entry fee, equivalent to the amount it would have had to pay, had it remained in membership. 18.1. For anything which is not covered by the present Statutes, the Executive Committee may take action in accordance with the decisions of the General Assembly or take the necessary decision, which must then be submitted to the next General Assembly for approval. 18.2. These Statutes become effective upon approval by a simple majority of the EFPM members. 18.3. Future amendments must be approved by a simple majority vote of the General Assembly. 19.1. The EFPM, in addition to the present Statutes, shall recognise Bye-Laws. The Bye-Laws may be formed and amended by the Executive Committee and shall in no case contradict the provisions of the present Statutes. 20.1. The EFPM can be dissolved only by decision of the General Assembly, convened by special invitation to the members, specifically citing that the General Assembly will decide on the dissolution of EFPM. The minimum period of notice between the sending of the invitation and the holding of the General Assembly shall be three (3) months. 20.2. In the event of dissolution of EFPM the General Assembly must decide on the use of the asset and must appoint two liquidators (Lawyers/cerified accountants) to implement the dissolution ruling. In the event of the dissolution or cessation of EFPM or in the event that its present purpose ceases to exist, the property of EFPM, as far as it exceeds the capital shares paid by the mebers and the common value of the members contributions in kind, may only be used for non-profit, charitable purposes as defined in the BAO (Austrian Federal Tax Regulations).